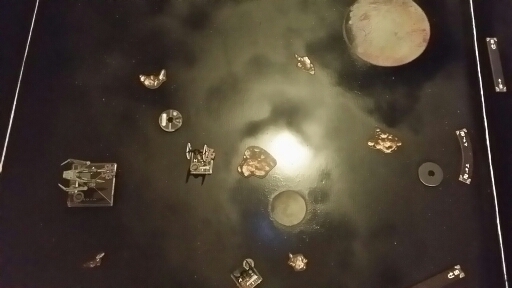 My son had the 2 x wing core tie’s and I took the IG200. This was about 47 points each and was the best we could field with my limited collection. Prior to this Game I sprayed up a board for use at home, a Photo of this board in play below. Good enough for me to play on. The white line is the 3ft mark giving a 6 inch shelf around on a 4ft board for cards and game detritus.